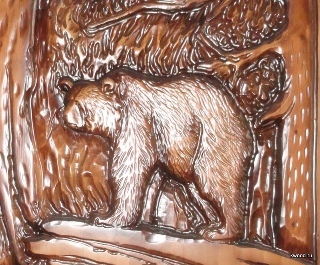 Interested in a carved wooden door? Looking for a great deal from a reliable manufacturer of natural wood products? We offer you to get acquainted with the opportunities, prices from our production company. We will help you without overpayment, in the near future to buy wooden carved doors with delivery from Siberia to any region of Russia. The company Bear Log, having a serious experience, excellent, solid volume of successfully completed orders, specializes in the design, production and construction of chopped houses, baths of larch and cedar, as well as a large list of products from natural wood. Among other things of the range, we produce beautiful carved doors from solid wood, attractive looking carved wooden trim. Here you can order the manufacture of carved doors, windows, platbands handmade for home and bath. Let's make entrance, interroom or bathing doors under the order of any configuration, from well dried, processed wood, both according to own drawings, and according to your sketch, taking into account all your wishes. We work with businessmen, legal and private persons, we offer different forms of payment for the order, we will organize the delivery of goods to different regions of the Russian Federation as soon as possible. we have a carved wooden door on the door, the price is much lower than that of most of our competitors, etc. Making an order in the company Bear Log - good houses of cedar, you are guaranteed to be satisfied with the quality of our products, reasonable prices and pleasant service.